Maine senators raise their right hands as they are sworn in during the first session of the 128th Legislature at the State House in Augusta, Dec. 7, 2016. Maine enacted legislative term limits in 1993, when 67 percent of voters endorsed the measure proposed through a citizen-initiated referendum. But 25 years later, the politician it targeted is still in office, candidates with legislative service dating to the 1970s are running and Maine’s citizen legislature is populated by elected officials who would have a hard time disputing that the label “career politician” fits them. Being a legislator is a part-time job, but it’s one that some State House regulars have held for decades. By switching from one chamber to the other or taking a couple of years off before launching a new campaign, lawmakers have found ways to stick around longer than the eight consecutive years limit in the law. Furthermore, voters have supported them. After four unsuccessful attempts beginning in 1979, legislative term limits took effect in 1993, a year after a scandal involving ballot tampering by an aide for then-House Speaker John Martin, D-Eagle Lake, who at the time had led the House for 18 years. Martin, who was the poster child for supporters of Maine’s term limits law, has served in either the House or Senate for all but four years since then and holds the record as Maine’s longest-serving lawmaker. Martin is eligible for two more terms in his current House stint and intends to seek re-election. Term limits as a concept play well when anti-government sentiment is high or when State House events elevate voter frustration. The 1993 referendum came two years after an acrimonious state government shutdown. Proponents of term limits convinced Maine voters in 1993 that longtime office holders focused more on accumulating power than governing, and that a regular churn of elected officials created by term limits would empower citizen legislators and inject fresh ideas into state government. 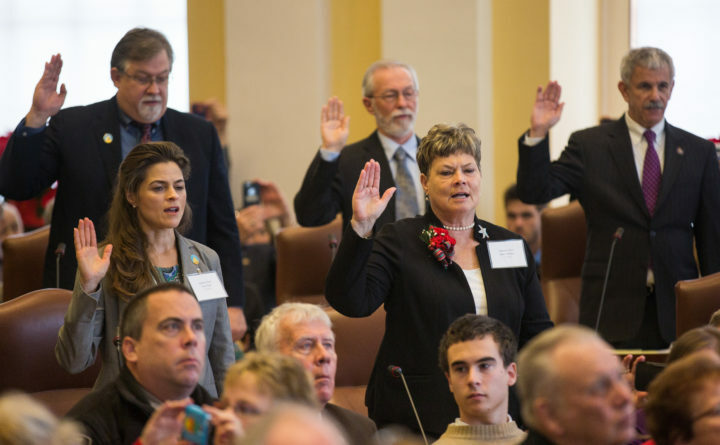 It hasn’t worked that way, and efforts to modify Maine’s term limits law have fizzled. Voters rejected a 2007 referendum to increase the maximum number of two-year terms in either chamber from four to six, and several legislative proposals in recent years to adjust term limits have also failed. That comes as a disappointment for some, including Mark Brewer, a University of Maine political science professor who has long opposed term limits, chiefly because he says they rob the Legislature of institutional knowledge. Other than Martin, another prime example of someone who keeps coming back is Republican Sawin Millett of Waterford, who is running for the House this year after being termed out of office in 2010. Millett, who said he intends to file for the race this week, has decades of experience running several state departments, including a stint as Gov. Paul LePage’s finance commissioner. Voters and party operatives who recruit legislative candidates seem to agree. They’ve had 25 years of precedent to demonstrate that Mainers care more about electing people they trust than adhering to the political ideology that spawned the term limits law. The deadline for party candidates to qualify for the ballot is Thursday, and here is a partial list of candidates whose campaigns illustrate ways to sidestep the term limits law. It’s long. — Rep. Russell Black, R-Wilton, is termed out of office this year and is running for the Senate District 17 seat being vacated because Republican Tom Saviello is termed out. — Assistant House Minority Leader Ellie Espling, R-New Gloucester, is termed out of office this year and is running for the Senate District 20 seat currently held by Sen. Eric Brakey, R-Auburn, who is leaving the Maine Senate to run for the U.S. Senate. — Rep. Stacey Guerin, R-Glenburn, is termed out of her House seat and is running for the Senate District 10 seat being vacated by Sen. Andre Cushing, R-Hampden. — House Majority Leader Erin Herbig, D-Belfast, is termed out of the House and is running for the Senate District 11 seat currently held by Senate President Mike Thibodeau, R-Winterport, who is termed out of office. She will likely face former Rep. Jayne Crosby Giles, R-Belfast, who served two previous House terms. — Rep. Louis Luchini, D-Ellsworth, who is termed out of office, is running for the Senate District 7 seat currently held by Sen. Brian Langley, R-Ellsworth, who is also termed out of office. Rep. Richard Malaby, R-Hancock, is termed out of office but is running against Luchini for the Senate District 7 seat. — Rep. Jeff Timberlake, R-Turner, is termed out of office but is running for the Senate District 22 seat held by Senate Majority Leader Garrett Mason, R-Lisbon Falls, who is termed out of office. — Rep. Mark Lawrence, D-Eliot, has served four previous terms in the Senate and three terms in the House. He has three terms of House eligibility left in his current stint there but is running for the Senate 35 currently held by Sen. Dawn Hill, D-Cape Neddick, who is termed out of office. — Rep. Brad Farrin, R-Norridgewock, is eligible for two more terms in the House but is running for Senate District 3 to replace Sen. Rod Whittemore, R-Skowhegan. — Rep. Matthew Pouliot, R-Augusta, is eligible for another House term but is running for the Senate District 15 seat being vacated by Sen. Roger Katz, R-Augusta, who is termed out. — Former Rep. Linda Sanborn, D-Gorham, reached term limits in 2016 and is now running for the Senate District 30 seat held by Assistant Senate Minority Leader Amy Volk, R-Scarborough. Volk, who served two previous terms in the House, is seeking her third Senate term. — Rep. Heather Sanborn, D-Portland, is eligible for three more House terms but is running for the Senate District 28 seat held by Sen. Mark Dion, D-Portland, a former Maine House member who is eligible for three more Senate terms but who is running for governor. — Sen. Michael Carpenter, D-Houlton, has served a total of 12 years in the Legislature and is running for his second consecutive Senate term in District 2. — Sen. Justin Chenette, D-Saco, served two terms in the House before switching to the Senate in 2016. He is seeking re-election to his Senate District 31 seat. — Sen. Benjamin Chipman, D-Portland, served three House terms before being elected to his Senate District 27 seat in 2016. — Sen. Paul Davis, R-Sangerville, served three terms in the House before being elected to the Senate District 4 seat in 2014. — Sen. William Diamond, D-Windham, was first elected to the House in 1976 and served three consecutive terms before being elected to the Senate in 1982 for two terms. He came back to the Senate District 26 seat in 2004 and stayed until he was termed out in 2012. Diamond regained the seat in 2014 and is seeking his third consecutive term there. — Senate Majority Leader Troy Jackson, D-Allagash, served three terms in the Senate before leaving for an unsuccessful congressional bid in 2014. He was re-elected in 2016 and is seeking his second consecutive term in Senate District 1. Former Rep. Allen M. Nadeau, R-Fort Kent, who served one House term, is running against Jackson. — Sen. Kimberly Rosen, R-Bucksport, served three House terms before being elected to the Senate District 8 seat in 2014. — Sen. James Hamper, R-Oxford, was termed out of his House seat in 2012, when he was elected to the Senate District 19 seat. He is seeking is fourth consecutive Senate term. — Assistant Senate Minority Leader Nate Libby, D-Lewiston, served one term in the House before being elected to the Senate District 21 seat in 2014. He is seeking his third Senate term. — Sen. David Miramant, D-Camden, served one House term before being elected to Senate District 12 in 2012. — Sen. James Dill, D-Old Town, served two terms in the House before being elected to the Senate District 5 seat in 2014. — Former Sen. John Tuttle, D-Sanford, who has served seven House terms and four Senate terms, is seeking election to the Senate 33 held by Sen. David Woodsome, R-North Waterboro, who is seeking re-election. — Former Sen. Margaret Craven, D-Lewiston, previously served three terms in the House and two Senate terms. She is running for the House District 59, which is currently held by Rep. Roger Fuller, a Democrat who is not seeking re-election. — Former Sen. Michael Brennan, D-Portland, served two terms in the Senate and is now seeking election to the House District 36 seat currently held by Rep. Denise Harlow, who is termed out of office. — Former Sen. Earle McCormick, R-West Gardiner, who served two House terms and three Senate terms, is running for House District 84 against Rep. Charlotte Warren, D-Hallowell. — Former Sen. John Nutting, D-Leeds, who served three House terms and six Senate terms is running for the House District 75 seat held by Timberlake, who is running for the Senate. Former Rep. Phil Curtis, R-Madison, who served three House terms and who was majority leader in 2011 and 2012, is running for the House District 111 held by Farrin, who is running for the Senate. — Former Rep. Ann Peoples, D-Westbrook, who was termed out of the House in 2014, is running for the House District 35 seat held by Rep. Dillon Bates, who is not seeking re-election. This list does not include former legislators seeking to win back seats they lost in 2016. With an open Blaine House seat being pursued by another long list of former legislators and slim partisan splits in the House and Senate, stakes are high so expect to see more familiar faces show up on Maine ballots this year.